You all know, I expect, that Stephanie Burgis is the author of the Kat, Incorrigible middle-grade series. Though I read a little MG, as a general rule I am much more into YA and adult, so I have been really pleased to see some of the MG authors I know and admire move into YA and adult – Sarah Prineas with ASH AND BRAMBLE, which is on my TBR pile, and now Stephanie Burgess with MASKS AND SHADOWS, which is officially out this coming April. Okay, so, MASKS AND SHADOWS. This is a beautiful cover, evocative although not specifically representative of the story, which is set in the late 1700s, in the Habsburg Empire – not a setting I’m particularly familiar with. The only historical character whom I recognized was Joseph Haydn and I can’t claim to know much about him, either. I see via Wikipedia that he really was employed by the Esterházy family for a good part of his career. I expect plenty of historically aware readers would probably know a good deal more than I do about many of the other secondary characters, like the Emperor and Empress of the Habsburg Empire. The story itself, it turns out, is not just about opera, it actually is an opera. It is filled with passion and drama, evil plots and heroic rescues, spurned wives and pouting mistresses, demon-summoning alchemists, ambitious noblemen, and the most famous castrato singer in Europe. Point-of-view characters are abundant, scenes are short, and the whole story weaves together just like a fast-paced stage production. You can practically hear the operatic score as each character steps onstage and each scene progresses. Of course, an opera is not really the same thing as a novel, and this story, which works so well if you think of it as an opera, is not quite what I was expecting. It weaves everything together so cleverly, but it doesn’t ever focus on any particular character or their relationships — this is not a failing, because that’s not what the story is trying to do. But it was a little bit of a surprise for me. 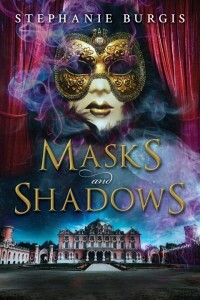 In MASKS AND SHADOWS, we have quite a large cast, including Charlotte von Steinbeck, recently widowed and now visiting her sister in Eszterháza; and Friedrich von Hollner, the sister’s husband; and Charlotte’s maid Anna; and Carlo Morelli, the castrato singer; and Franz, a tenor. And then a whole bunch of important secondary characters. My favorite pov character was Anna, who starts out as Charlotte’s maid and is unexpectedly recruited as a soprano, though she doesn’t know anything about opera or acting, can’t read music, and doesn’t even speak Italian. What a situation! Innocent, even sheltered, but brave, Anna drives the plot at least as much as any character mentioned in the back cover copy. I would have liked a novel at least twice as long as this one, mainly focused on her. My favorite secondary character was Princess Esterházy, set aside by her husband in favor of a pretty, shallow, selfish twit of a girl. The Princess, with her clever, clear-sighted bitterness and her startling companions, would also have made a great main character in her own novel. Given the actual structure of the story, however, there wasn’t much room to develop Anna, or the Princess, or anyone else. Some room, yes, and a couple of the pov characters take unexpected roles as the crisis unfolds, but this was really not the kind of novel that focuses on deep character development. If you’re into opera, though, chances are good you’d enjoy seeing how Burgis does in words what an ordinary opera does on stage — especially if you’re familiar with the historical period. The only other novel I can think of that is really an operetta is the brilliant HOW MUCH FOR JUST THE PLANET by John Ford – and that’s a Gilbert & Sullivan comedy disguised as a Star Trek novel. Can anybody else suggest a novel that strikes the reader as “really” something other than a novel? There’s a recurring flaw in alternate history novels of wanting to be nonfiction history books (well, pseudo; about history that never happened), but that’s not quite what you’re asking about.